I love sauerkraut on my dogs but hubby doesn’t. I don’t use much so this idea is absolutely great. Bought a few and it is the perfect size for me. Thanks and it taste great! We both love kraut on our dogs and brats, but cannot always find Franks at our store. We grill out ALL year long. Just found this on the condiment isle at Sams Club. Have never seen before. 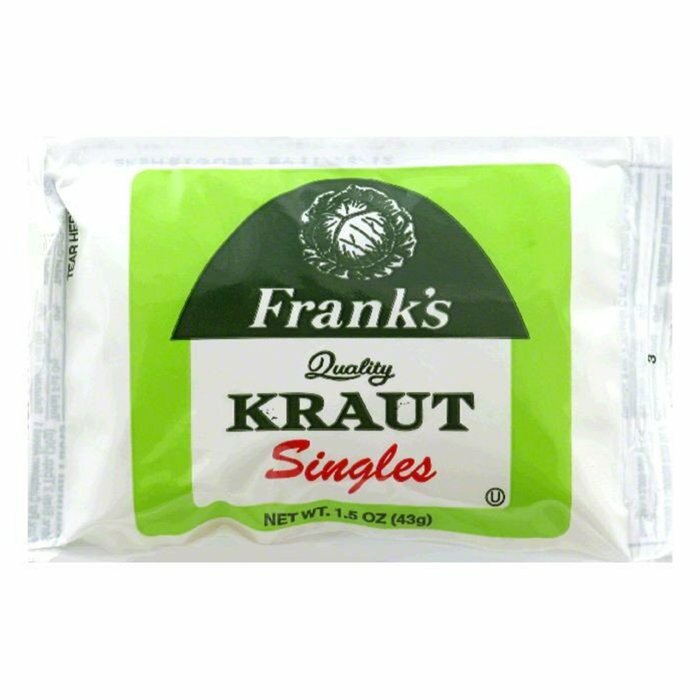 Where can I buy Frank’s Kraut Singles near Burlingame, CA 94010? Our Frank’s Kraut is the #1 brand in the Midwest. Unfortunately, we do not have any locations in California that carry our kraut. You can order online, shipping is free! Great size great product but does it need to be refrigerated? Great question. Refrigerating our Singles will help extend their shelf life. How do you cook the singles? is the bag microwavable? You don’t have to cook the Singles because they are “ready to eat.” If you would like to microwave the Singles I would punch a hole in the bag and start at 5 seconds. Cook time depends on your microwave wattage. Enjoy!